Until now, the blogging community has been spared by the Indian taxation system because there is now clarity over the bunch of laws that shall require the bloggers to register and comply. This is because bloggers earn the most of the income from advertisement and that too from the Google ads or referral income from Amazon or Flipkart. However, the GST is altogether a different spoon altogether. GST shall mandate every person including the bloggers to register otherwise there will be a stringent penalty for non-compliance. 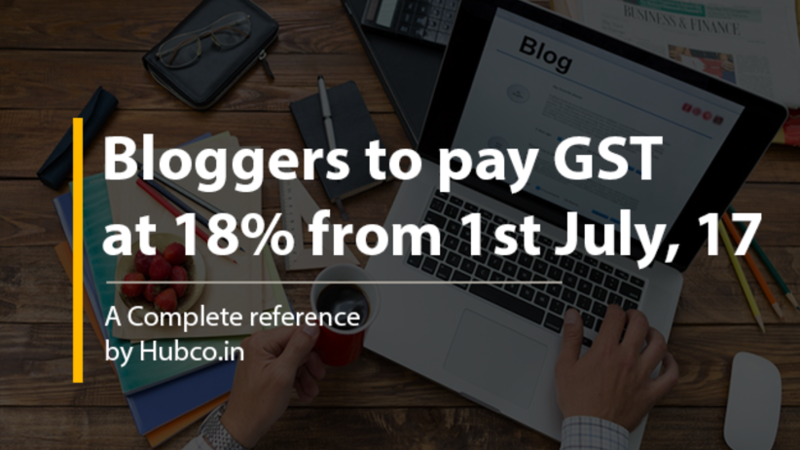 Therefore, in order to provide clarity to all the blogging community in India, we have written this article to discuss the impact of the GST on bloggers in India. What is blogging and how it is taxed currently? In simple terms, blogging is an art of writing content on the internet. Perhaps, all the internet companies have a blog or learn section integrated on their website to increase their reach on people and they update it regularly. The content on the internet when hits the search engine, generates traffic and this traffic makes blog famous. Further, on internet more traffic means more advertisement income. Advertisement income treated as service under Indian taxation law and hence, the same is taxed accordingly. However, under Service tax law, there is not much clarity on the provisions as to whether the service tax registration is required on not because the blogging income is generally paid from outside India. "Further, we have a bad news for you that service tax law will be discontinued from 1st July 2017 and GST shall prevail." The new GST law is very clear about who all are required to be registered in India. As per section 24 of the Central GST Act, every person who is earning any income from outside the state or outside the country is required to get GST registration and the exemption limit shall not apply. In other words, the exemption limit of Rs.20 lakh is only valid for small dealers/service providers who generate their income from within state, but if you are a service provider i.e. blogger, and generating income from outside India (export of services), then GST registration is mandatory and exemption limit shall not apply. Further, under GST, the blogging services are covered under online information and database access or retrieval services. For no return filing – Rs.100 per return per day. As stated above, any person including bloggers who are generating income from outside India than the exemption limit of Rs.20 lakh shall not apply. Do Bloggers now liable to Pay GST at 18%? Yes, bloggers are now liable to pay GST in India because bloggers now get their income from India and not from outside India and hence, their services are not considered as exports and therefore, all the bloggers are liable to pay GST even if they earn even a single rupee from advertisement income from India. Further, if you earn anything from outside India, then you need to verify whether that payment construed as exports of services or not. The recipient of service is located outside India – If you are receiving payment from Google India, then it shall NOT be treated as export of services and you shall be liable to PAY GST. The payment of such service has been received by the supplier of service in convertible foreign Exchange. If you fulfil all the above conditions with the place of supply being outside India, then the blogging income shall be treated as export of services and no GST shall be levied. The place of supply in case of bloggers shall be the place of a recipient of services. However, the recipient of services shall be treated to be in India if any two of the following conditions are fulfilled. In simple words, if any two of the above conditions are satisfied then the place of supply shall be deemed to be in India and hence, your blogging services shall not be treated as Export of Services. The GST tax rate on bloggers is 18%. If you own the property, then ownership document like electricity bill, tax receipt/property tax receipt or registry documents of that place. If you are on rent, then copy of rent agreement/lease agreement with electricity bill in the name of the owner. If you neither own the property nor on rent, then submit electricity bill along with a copy of NOC. File consolidated return by 20th of the following month. Pay all required taxes by 20th of the following month. Upload each and every invoice to the government portal. Composition scheme is a benefit extended to small dealers up to the annual turnover of Rs.75 lakh by which they don’t need to comply monthly, rather they can need to file returns quarterly and they need to pay taxes @ 2% of the total revenue and not 18%. However, bloggers income generally is in the nature of interstate services, and therefore the benefit of composition scheme does not apply to bloggers in India. I have tried to cover each and every important aspect of the GST impact on bloggers. However, GST is so much complex that you should confirm anything before replying on any part of this article. Further, if have any query relating to any part of above article, kindly write to us at info@hubco.in.